For the uninitiated, National Hot Dog Day may sound pretty straightforward. It’s a celebration of grilled wieners and toasted buns, and the long history this iconic summer meal has had in North America. But there’s far more to this pork-based pig out than that. This July 17, you’ll have the opportunity to learn all about why people come together throughout the hot dog-eating world to celebrate National Hot Dog Day. While the exact history of National Hot Dog Day is as obscure as the ingredients of your uncle’s secret dog sauce, we’re not too worried about the origins. What’s more important these days is the myriad ways people celebrate all over the country. Typically, restaurants or fast food chains will offer deep-discount dogs, while some cities host day-long events to raise money for a specific charity. Here you’ll find some of America’s most treasured champions: Hot dog eating winners, root beer chugging enthusiasts, and lightning quick wiener dogs, just to name a few. Charles Feltman begins selling sausages in rolls on Coney Island in New York. Across the countries, cities and towns are holding official parties to celebrate dog day. If you’re in the Washington, D.C., area, check out the Hot Dog Lunch on Capitol Hill, where you can chow down and rub elbows with more than a thousand members of Congress, lobbyists, journalists and other government officials. Just be sure not to spill your mustard on them. Other famous parties can be found in the village of Alfred, New York, and Huntington, West Virginia. All you need is a grill, some friends, a hot summer day, and some cold drinks to have your own footlong fiesta. Get creative by setting up a bar with less-than-common condiments, and see how adventurous you and your friends really are. Every city’s got one. That one restaurant that boasts having the greatest hot dogs in the state. Do a little research in your own area, and perhaps make a road trip out of it to test whether it really is the cream-of-the-crop Coney. While the deep origins of the hot dog can be traced back to either Frankfurt or Vienna (we’ll let them slog it out for the title of true originator), the American hot dog dates back to the 1860’s, when German immigrants started selling them from stands in New York City. 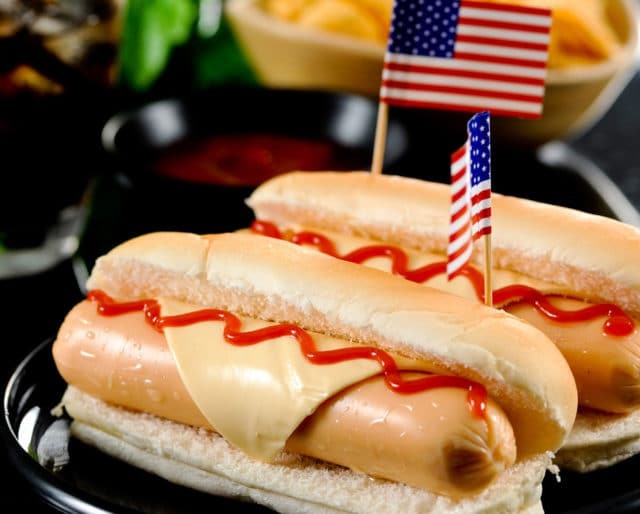 Splash of ketchup here, little bit of mustard there, and you’ve got the birth of the American hot dog. In the mood for an all-beef Chicago dog loaded with toppings on a poppy seed roll? Or are you more of a Texa Chili Dog kind of person? Perhaps the basic, original New York dog is all you’re looking for. Regardless, wherever you are in the country, you can try a unique variation on this once-German/Austrian (whoever you want to believe) tradition. If you need a quick and easy meal this summer, look no further. Boil them, grill them, heck, eat ’em cold as long as they’re precooked. It’s the simplicity and affordability that makes them such a great summer snack. Who wants to stress over what to cook anyway?